How do I download the command-line emacs instead of the GUI one? I used sudo apt-get install emacs to download emacs. I expected the command-line emacs to start when I ran emacs but instead the GUI emacs started. How can I download the command-line emacs? 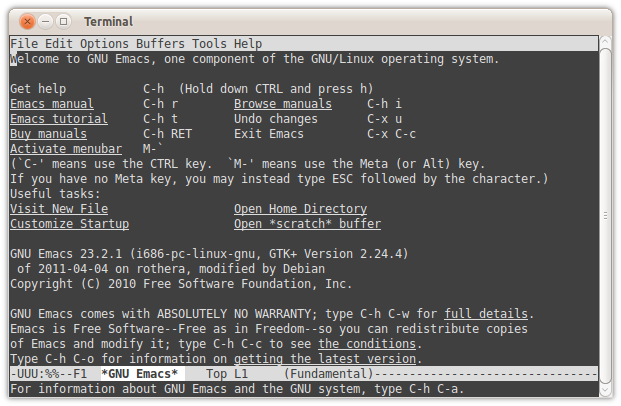 The command-line emacs is installed along with the GUI. is done in that window. That would be emacs-nox I believe. This is the meta-package that currently points to emacs24-nox . If possible, delete the old version of emacs, then reinstall the version without X. The * on the end of the command is important and will save you from a world of pain. You can also specify the version of emacs without X to install, such as emacs23-nox or emacs24.nox rather than installing the alias package. Sure, you can mess with bash aliasing or pass in -nw, but when you use sudo, or emacs is summoned by git, you'll see that X window once again. You already have installed it. I think I accidentally downgraded a post without intending to. emacs -nw is the correct option. I just get tired of the vi/emacs flame warz. If the original post didn't mention vi, then mentioning vi doesn't help. Besides, emacs has a vi mode in it - viper-mode. Not the answer you're looking for? Browse other questions tagged command-line emacs or ask your own question. How do I set environment variables in an Emacs session launched from Gnome Panel? How to change font size in emacs? How to start GUI from command line? Xubuntu 13.04 boots to command line instead of GUI. How to get back GUI? How do I get emacs to open in the terminal when it is being used as the config editor? how to uninstall emacs from command line? ubuntu 14.04 emacs: how to revoke the fullscreen default? How to make emacs to start allwais --nw if I launch it from command line?